Ofsted is in urgent need of independent review in light of concerns about its objectivity and reliability, local government leaders have said. A series of leaks and U-turns have thrown the independence of England's education watchdog into question, said the Local Government Association. A review would "restore faith", Cllr David Simmonds, chairman of the LGA's Children and Young People Board, said. Ofsted said doubts about its reliability were "simply incorrect". But the LGA said cases such as Ofsted's re-inspection and downgrading of five of the "Trojan Horse" schools in Birmingham have undermined the watchdog's credibility. It said these inspections, after the schools hit the headlines, downgraded them from "good" or "outstanding" to "inadequate", in some cases in less than a year. "Which verdict is to be believed?" asked Cllr Simmonds. The LGA also cast doubt on the downgrading of Haringey Council's children's services "from 'good' to 'inadequate' once the Baby P scandal broke in the media". It said these cases "raise questions as to the validity of the inspectorate's judgements as it is quick to re-inspect and often downgrade schools which are embroiled in a scandal, even if it is an historic report". Cllr Simmonds said Ofsted had been the subject of "too many controversies". "Councils, communities and parents need to know Ofsted and the chief inspector are independent and free from political influence and we need an independent review to discover what has gone wrong and restore faith in what is fast becoming a media-driven organisation," he said. "This is not a defence of underperformance; there is no place for it in our schools and children's services. "Ofsted's knee-jerk response to a scandal seems to be to re-inspect school and declare it failing, but not every scandal will be true. "We want to know that when Ofsted go into a school, they are being fair and impartial and are not playing to the court of public opinion." The call for a review has drawn support from some teachers' unions. NUT General Secretary Christine Blower said the inspectorate "no longer has the confidence of the teaching profession". "In this regard we are prepared to support an independent review, but nothing short of Ofsted's abolition and replacement will be a sufficient outcome." Russell Hobby, general secretary of the National Association of Head Teachers, agreed the necessity of a "fundamental review". "Too often, overworked and underskilled inspectors have time merely to confirm what the data already tells us, copy some narrative from a previous report and rush on to the next school." An Ofsted spokeswoman responded that it was the watchdog's job "to hold every institution to account and to report without fear or favour. "We make no apology for championing the interests of those who rely on the services we inspect nor for bringing our findings to wider public attention. "Shining a spotlight on underperformance, however uncomfortable, helps bring about change. "But it is simply incorrect to suggest our inspection judgements are influenced by anything other than the evidence we find. "We know that previously high-performing institutions can deteriorate rapidly when they suffer staff turbulence or a sudden change in leadership." The spokeswoman said recent figures suggested 93% of schools and 95% of colleges were satisfied with the way their inspection was carried out, and 85% believed the process had helped them improve. 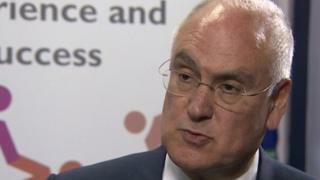 Ofsted Chief Inspector Sir Michael Mr Wilshaw is due to address councillors and local authority professionals at the National Children and Adult Service Conference in Manchester on Friday morning.